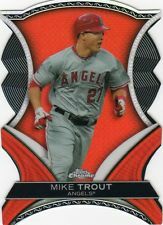 Mike Trout Rookie of the Year? While Mike Trout may be just a 21 year old rookie and obviously has a long way to go in his young career he also is a lock for the Rookie of the Year Award and and possibly a front runner for the AL MVP Award. Trout has put together a season that most good hitters dream of, not to mention his defensive play in the outfield could earn him a Gold Glove Award. Trout is currently leading the American League with a .328 batting average, with 27 homers and 77 RBI’s in just 118 games this season; Trout is also a future Triple Crown threat. With Trout only being 21 years old it is obvious that he has a long way to go and should only progress as a better all around player. The other reason I think collectors should pay attention to Trout is that he has the potential for amazing career numbers, a player this talented and still possibly 5 or 6 years away from hitting his prime could threaten any offensive career record in the league. When it is all said and done twenty years from now we may be talking about Mike Trout the best player since Babe Ruth, the sky is the limit for this kid as he continues to amaze fans and teammates.